A 32 year old male with a history of HIV presented with a non-productive cough, pleuritic chest pain, and subjective fevers and chills. The patient’s CD4 count was 23 cells/mL; he was not on highly active anti-retroviral therapy (HAART) or prophylaxis for opportunistic infections. A bronchoscopy was performed out of concern for opportunistic infection; a silver stain of bronchoalveolar lavage fluid from the right middle lobe revealed the following. 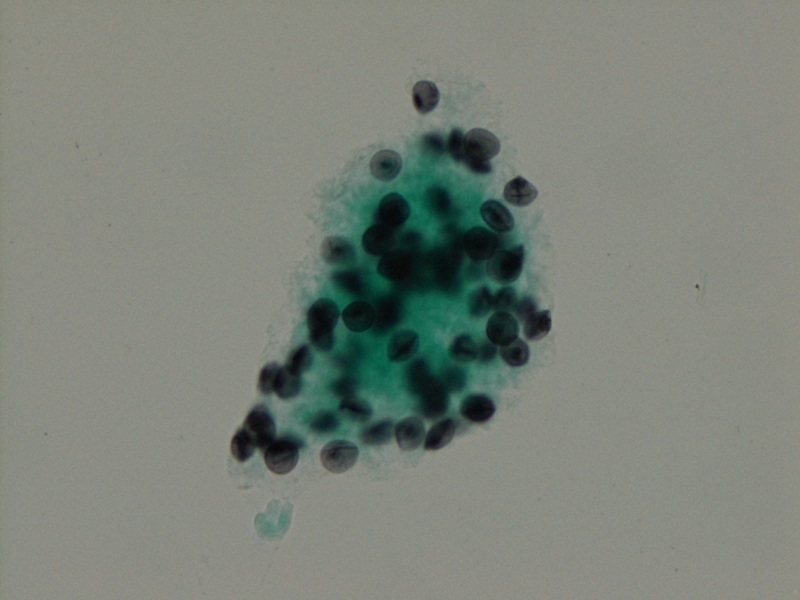 Pneumocystis jiroveci (P. carinii) was identified based on morphologic examination of the silver stained fluid. The spherical, slightly dented or concave firm-walled cystic form (4-7 mm in diameter) was identified within the foamy alveolar fluid. Flexible-walled trophozoite forms may also be present in pulmonary fluid but are difficult to recognize. The organism may also be identified by a monoclonal antibody microscopic method of detection (highly sensitive but expensive and may have nonspecific staining) or nucleic acid amplification methods. The organism does not grow in routine culture. Pneumocystis is an opportunistic pathogen with worldwide distribution that has closer homology to fungi than protozoa, which is why the name was changed from P. carinii to P. jiroveci. Its life cycle is not entirely understood, but there are cyst forms, sporozoite forms, and trophozoite forms. Infection is acquired by inhalation. It is believed that most people are sub-clinically infected during childhood and that the infection is usually well contained by the immune system. During times of immunocompromise, the organism adheres to type I pneumocytes and replicates extracellularly while bathing in alveolar lining fluid causing the alveolar spaces to fill with foamy material. The organism is not susceptible to common antifungal agents and is treated with trimethoprim-sulfamethoxazole. -Lauren Pearson, D.O. is a 2nd year anatomic and clinical pathology resident at the University of Vermont Medical Center.